The flowers and trees read the calendar correctly, and I see evidence all around that spring is here. 1. 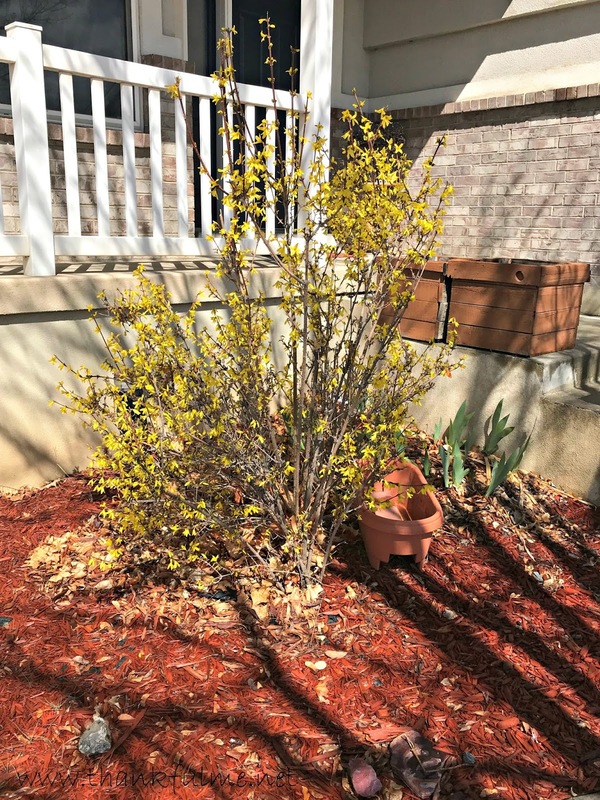 I'm thankful that the original owners of the house we are renting landscaped so nicely, and we get to enjoy the ever-changing display of flowers and vegetation. Photo: An otherwise bare tree is starting to display beautiful pink blossoms. 2. I'm thankful that previous owners of the house we bought and will be moving into planted some fruit trees. 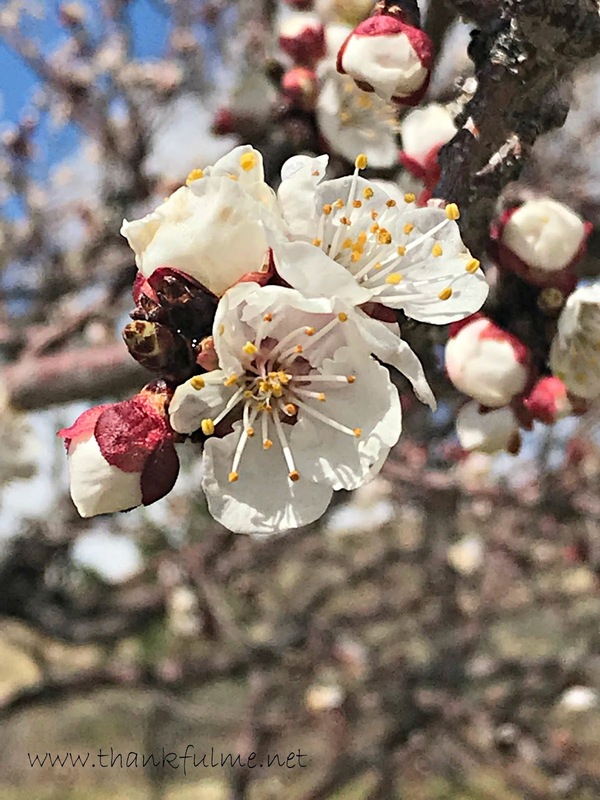 Photo: "Popcorn" is popping on the apricot tree. 3. I'm thankful that the major remodeling inside the house is done. The stove is hooked up to the gas line. Photo: The stove sits in its place, with counters on either side. 4. I'm thankful the plumbers came and installed the kitchen faucet and dishwasher. Photo: The kitchen faucet takes its place by the corner sink. 5. I'm thankful for the discovery of flower bulbs popping up all over the yard. Photo: The bright blue Glory of the Snow flowers offer a cheerful spring greeting in the yard of the house we are renting. 6. I'm thankful for blossoms that helped me identify the bush outside our front door as a forsythia. Photo: The yellow blossoms are a tell-tale sign of forsythia. 7. I'm thankful that, if the car's tire had to go flat, it became flat overnight in the garage, instead of interrupting travel. I'm also thankful that John put the spare on, and that the tire store was able to quickly install new tires (which were needed). 8. I'm thankful for a nice Relief Society dinner. It's always nice to have a chance to get to know the women at church better. 9. I'm thankful for extended family. We saw John's parents twice this week: once for dinner, and to watch a concert together (Jazz at Lincoln Center with Chick Correa), and once at their house. We also got to visit with John's brother and sister-in-law. 10. I'm thankful for John. We got a lot of work done this week, but we also spent time relaxing. 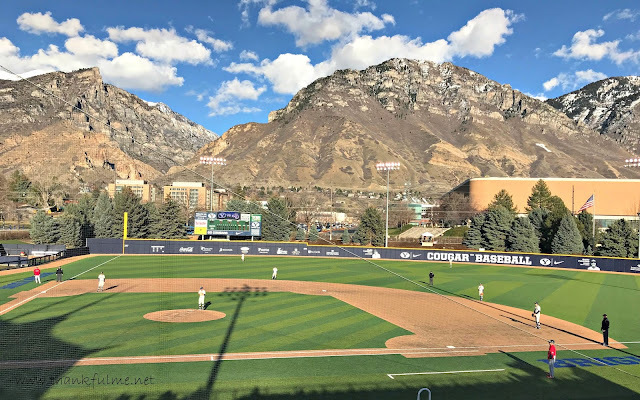 We've decided that BYU baseball is a good replacement for the A ball we used to watch in California. Photo: The BYU baseball stadium sits at the base of the Wasatch Mountains. Fluffy white clouds punctuate a deep blue sky. What does spring look like in your neck of the woods? What are you thankful for this week? Thanks to Josie Two Shoes, we have this link-up every week. Feel free to join us as we recount what we are thankful for! 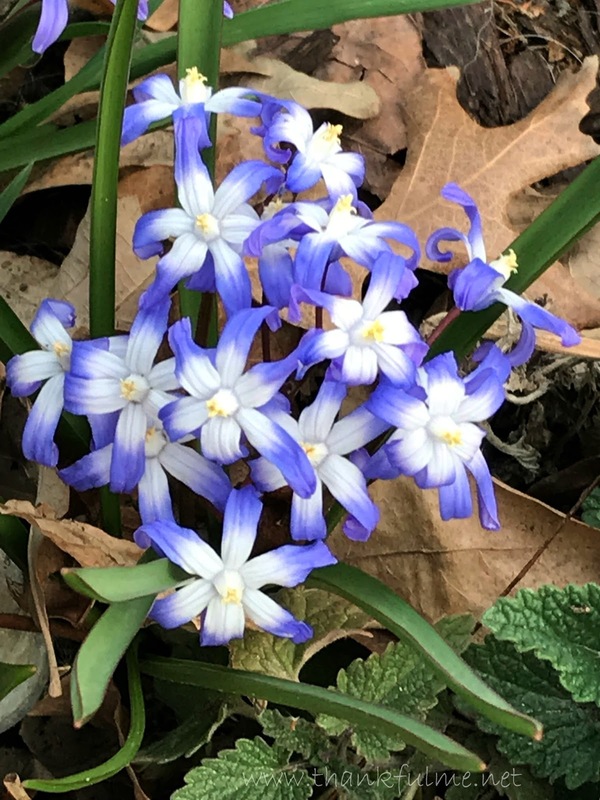 I almost shared a photo of those same little blue flowers. I didn't know what they were called. I love the photo of the apricot tree blossoms! That is funny about the drone gifts. It reminds me of the time my brother and I both gave our Dad view finders. We thought he would surely enjoy such a gift. . .twice. We didn't realize it was really a child's toy. They were brand new on the market. That's a funny story about the view finders. 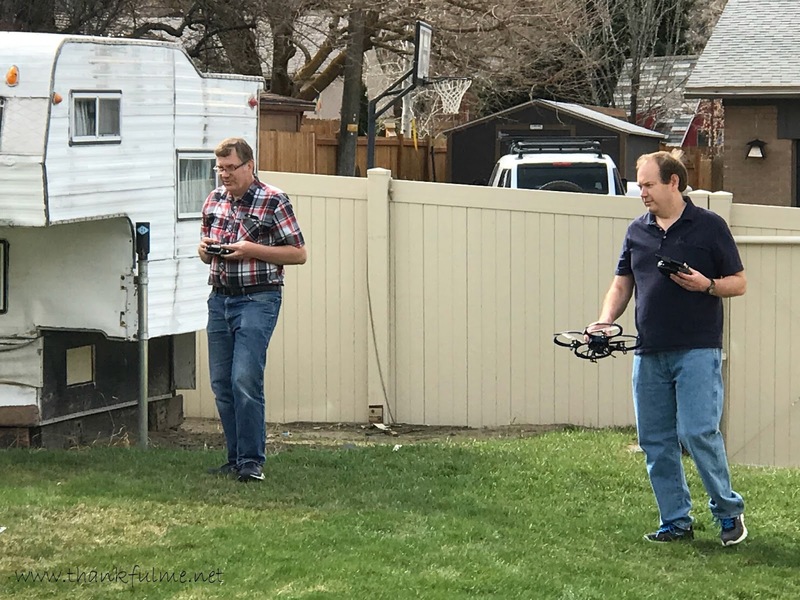 I think John's dad had mentioned how interesting drones were--not as a hint, but just in passing--and that's why John and Barton both ended up getting him drones. 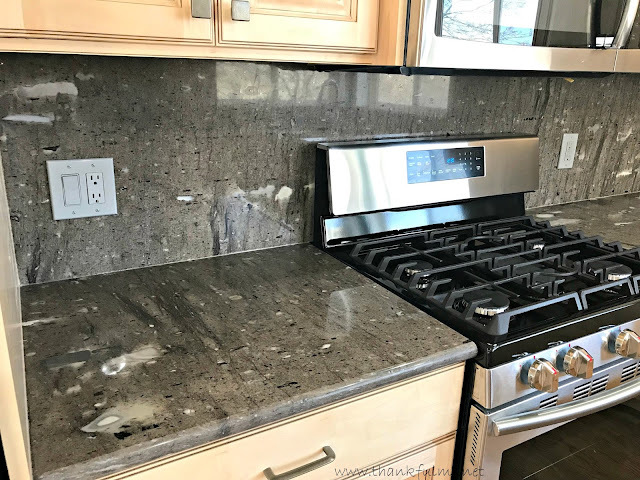 Really like the granite in the kitchen. There (appears) to be marbling or whatever they call it in stone where there are 'blotches' of lighter minerals in the rock (photo 4). Very nice effect, like the grain (in wood), at least in one photo(photo 3). Funny you should mention BYU baseball. My interest in sports is pretty much golf. On tv. Of all the sports, baseball, like, at the bottom of my list. Except college baseball ...on the radio Weird, no? I'll always tune into a game when I'm driving. There's something about the announcers (pretty much students and former students). Obviously not professional sports announcers but have an enthusiasm thats quite engaging. You're way ahead of us on the seasons. Still snow on the ground here. I didn't really watch baseball when I was growing up, but John and I have enjoyed going to the games throughout our marriage. I do feel a certain connection to the game, though. My dad played college ball, and his dad and granddad played for professional farm teams. Spring is fickle. Snow is forecast here today, too. Beautiful photos, Kristi. Spring hasn't shown too much of its beauty here. There were several robins hopping among the snow-covered vegetation and fallen branches. Your post gives me hope. 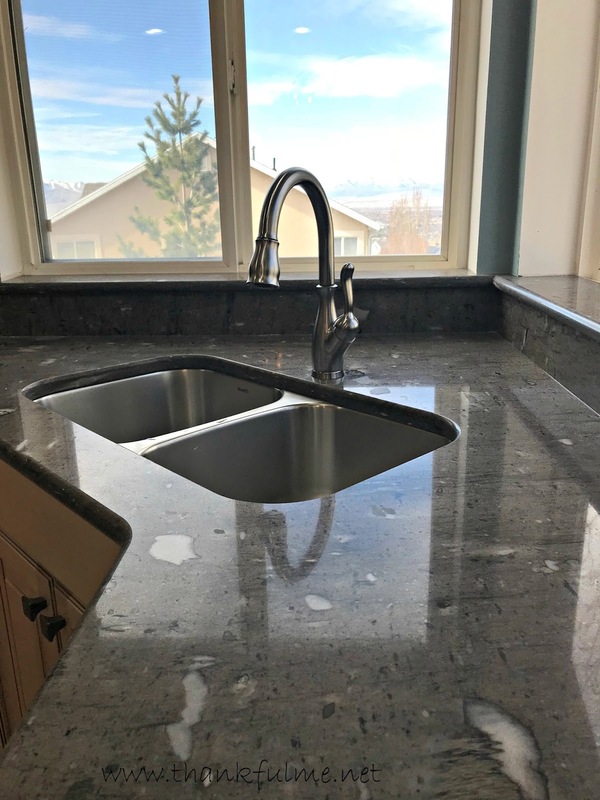 The corner sink, the whole kitchen, is excellent. I bet you are going to cook up some yummy dishes. When is moving day? We are supposed to get some snow tonight. Spring is a fickle season. Moving day is more like moving days, as we are taking our time to move gradually. We will be in the house for good sometime this summer. Now that the work on the inside is done, with a few little exceptions, we will turn our attention to the outside. We need to get a fence up for Drexel, and a doggy-door would be nice. Spring is being shy and only offering minimal hints of arriving. I noticed the tulips a just beginning to break through the crusty soil. It's actually a very different picture in my yard at the moment; the snow is accumulating now. Nice list of thankfuls. A flat tire at home is definitely better than when on the road. Have a great week! As I was driving out of the driveway, it felt like I had a flat, but none of my warning lights were on. Thankfully, I trusted my instinct more than the dashboard. The tire was flat, flat, flat! 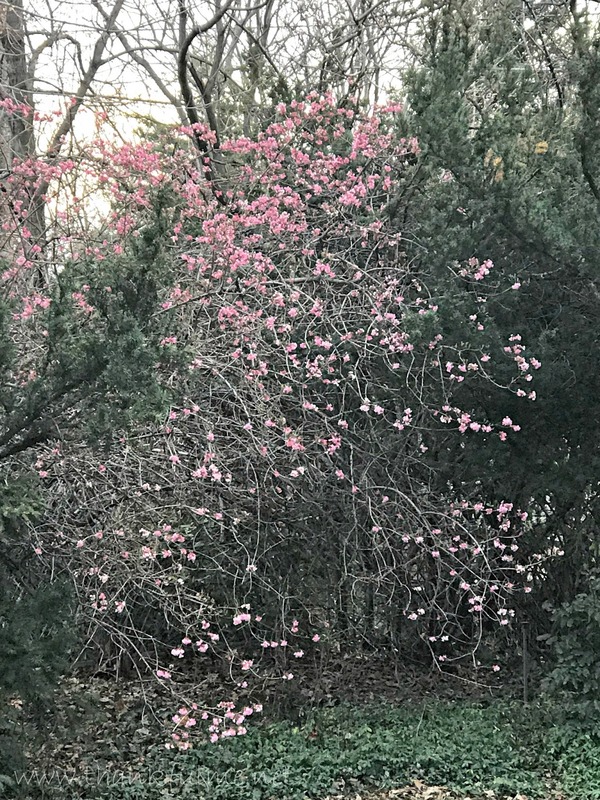 Spring is pink, blue, and yellow flowers. Thanks for sharing them, as this green and growing season just begins to show itself. Spring is a beautiful, colorful season.